The Night Raid is a re-telling of the story of Nisus and Euryalus from Book 9 of the Aeneid, specifically aimed at dyslexic teenage boys. It's written by Caroline Lawrence, author of The Roman Mysteries, and published by Barrington Stoke, who specialise in books for dyslexic and reluctant readers. 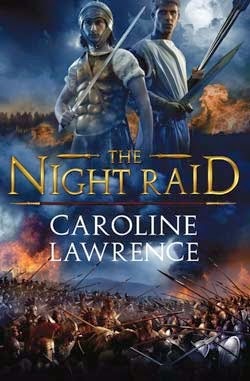 Caroline has blogged about the process of writing The Night Raid and aiming it especially at dyslexic readers here. I don't want to go into the book as a book for dyslexic readers too much, as Caroline has explained that much more clearly than I can herself and it's not something I know much about. So instead, I'll just say a few words about how that particular emphasis affects the book for general readers, because it would be a terrible shame if knowing it has such a particular target audience put everyone else off reading it. Essentially, this is a book written in a very clear and simple style but not aimed at particularly young readers. The target age range is 8-12 but, as you can see from the opening posted at Caroline's blog, the book is extremely gory (for a children's book) so it's aimed at either the older end of that range or younger children with strong stomachs (as I've said before, I was a right wuss when I was eight years old - everyone else in my class would have loved the gore I'm sure). I am firmly of the belief that you don't need complex language to tell a good story or make a clear point (this is something I try to practice in academic work, as far as possible) and this is an exciting and emotional story that had me happily hooked. The main thing strong readers might notice is that, like books for younger children, the story is told in very short chapters made up of very short paragraphs and short sentences, and the book overall is shorter than some 'short' stories (at 10,000 words). Simpler Latin names like Turnus and Nisus are left as they are, while nick-names are substituted for awkwardly spelled names ('Rye' for Euryalus, 'the Leader' for Aeneas and most amusingly, 'Flame Head' for Neoptolemus, specifically because "his real name was too long and too horrible to say out loud"). Most of the other changes or alterations to make the book dyslexic-friendly probably aren't noticeable to general readers at all. The best thing about the language used here it that it reflects Virgil's original Latin while keeping it readable and comprehensible for reluctant readers with no knowledge of the original. This is most obvious towards the end, when a few lines of the Aeneid are translated into English (though the Aeneid's line about 'as long as the father has imperium', a reference to Augustus' imperial power, is left out and replaced with a reference to the characters' eternal souls, to make the lines apply to Nisus and Euryalus' ongoing legend right through to the present day rather than tying it to the ancient Roman Empire; Aeneid 9.446-449). However, there are other, smaller references throughout, like the description of Euryalus' head drooping like a poppy in the rain as he dies, which comes straight out of the Aeneid. A deliberate choice is made to tell the story as a Roman story, rather than as a Greek legend, again reflecting Virgil. This is most obvious when Euryalus refers to Latin as 'our language'. The story of the Trojan War is a Greek story about people from modern Turkey. Whatever language and culture the historical inhabitants of Troy had, in Greek literature they generally speak Greek and live in a vaguely Greek society - exactly what society the Homeric Trojans represent is the subject of intense academic debate, but they worship Greek gods, at the least. Latin literature varies in how far it represents them as Greek or as Roman and uses the Latin names for the gods (Juno not Hera, Jupiter not Zeus etc.). In the Aeneid, Roman customs such as worshiping household gods (which is also included here) are attributed to the ancient Trojans. Nisus and Euryalus appear for the first time in the Aeneid and may be inventions of Virgil's so it makes sense to leave out the complicated historical setting of the story and just represent them as Romans. And so they speak Latin, address the gods by their Latin names and the description of Euryalus' Trojan home fits that of a Roman villa. This also extends to their afterlife belief, though once we reach the end, the book's treatment of the characters' existence after death is more of a combination of a more general spirituality with a much older, Greek, theme from the Homeric poems. In the Iliad, Achilles' aim is to win eternal kleos (glory) because, what with the Homeric afterlife being a rather miserable place, being eternally remembered in legend is your best chance at living forever. The Night Raid literalises this Homeric idea, as Nisus and Euryalus' souls are reunited and sustained by Virgil's telling of their story. The exact nature of Nisus and Euryalus' relationship is, as in the Aeneid, unspecified. In general terms, the characters seem to fit perfectly the traditional Greek pair of an older and a younger (unshaved) lover, erastes and eromenos (lover and beloved). However, the Romans were slightly less keen on this idea in a military context, and Virgil describes Nisus' love for Euryalus as 'pious' (pius, a noble virtue especially important to Augustus; Aeneid 5.296). Some readers must have understood them to be lovers, while others would not. The Night Raid similarly leaves this up to the reader's imagination - when Nisus notes how beautiful Rye is, or holds his hands, it might be romantic, or they might just be really good friends (and interpretation will depend partly on the age of the child reading the book - younger children are unlikely to notice anything beyond friendship). I really enjoyed this book. The characters were likeable and engaging, the story would make sense if you didn't know any ancient mythology but gains extra depth if you do and the action was exciting and definitely doesn't pull any punches. The language is simple, but the themes of the story are very complex, so it's a really nice choice especially for older children who struggle with reading, and who may appreciate a story with the depth (and gore) of more complex literature, but written in a style they can read for themselves. I also found it a really nice palate cleanser if you've been reading through something really dense, like A Song of Ice and Fire or, (in my personal case at the moment) Robin Hobb's Realm of the Elderlings books. This has all the magic, fantasy (there are nymphs in it), complicated romance/deep friendship, adventure and gory, horrible death of those series, but in a fraction of the time it takes to read it! Probably my favourite Lawrence book since The Gladiators from Capua (as you tell, my tolerance for violence has got a lot stronger since I was eight years old). Highly recommended. See all my reviews of Caroline Lawrence's Roman Mysteries series here.